I was around nine years old, and started by going to a friends birthday party! I was hooked from then onwards! My husband's life long dream has always been to live and work in the Caribbean - he was drawn by the beautiful beaches and year round warm temperatures. I never wanted to leave the UK as it would have meant giving up my horses! Around four years ago, after struggling on and off for years, I was diagnosed with a problem in my hip. Apparently, being too young to operate on, I was left with no choice but to give up riding and sell my horses. My husband saw this as a chance to achieve his dream, and we both found jobs in the British Virgin Islands. Unfortunately for us, the timing of our move co-incided with the most powerful hurricane ever to hit the Caribbean (Hurricane Irma), and after only a week of living in paradise, our dream and the island we had just moved to were destroyed. We found ourselves being evacuated to the Cayman Islands by my husband's employer, to live for an undetermined period of time until the BVI could recover and be safely habitable. 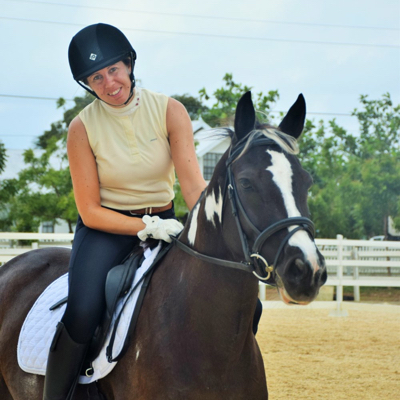 Shortly after arriving in Cayman, I discovered there was a riding school on the island, and having not tested my hip out for a few years, I decided to pop along and see if it could withstand half an hour of riding. My visit co-incided with a vacancy arising for a rider/instructor, and after finding out my hip seemed to withstand a couple of rides, I promptly accepted a job offer! 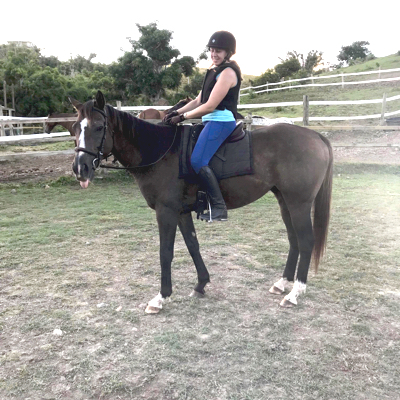 I spent a wonderful six months riding and training young horses owned by livery clients in the mornings, and teaching children and adults lessons in the afternoons. The warm weather seems to allow me to ride pain free! I introduced the riding school to the idea of Dressage Anywhere, having heard about it when living in the UK, and the rest is history! In May 2018. I returned to the BVI, and back to my regular day job as an Accountant! I'm still riding horses here - I'm currently retraining a four year old ex racehorse who has been off work for over a year since the hurricanes. Princess is a four year old bay Arab x Quarter horse and Lilly is a five year old Paint x Warmblood. As both horses were young and had done no/little dressage, we started at Intro and worked up to Prelim over the six months I was riding them. My goals have somewhat changed for 2018! Equine life in the BVI is a challenge. I'm working with some great horses, who have been through an awful 14 months since the hurricane. My goal for this year is simply to get a few of them back into regular work. The climate and terrain in the BVI! I was amazed to get 1st place on both Princess and Lilly in our first month of competition, even if it meant it was hard to improve on that going forwards! I have always been a showjumper. 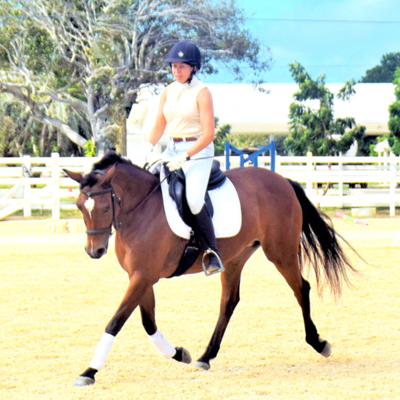 Only when my hip started to play up a year before I finally gave up riding, did I take up dressage. I heard about it through friends in the UK. I can live anywhere in the world and still compete under the British Dressage system, which I believe provides the best training scale for young horses to develop, grow and improve correctly. Since January 2018 (and I hope to be back again soon! ).